The break statement is used to terminate a loop, switch or label statement. lable1: Identifier associated with the label of the statement. The parameter is required if the statement is not a loop or switch. 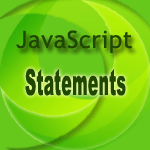 The following web document demonstrates how break statement can be used. <input type="text" placeholder="Input a number bwtween 2 to 10"
See the Pen break-1 by w3resource (@w3resource) on CodePen.